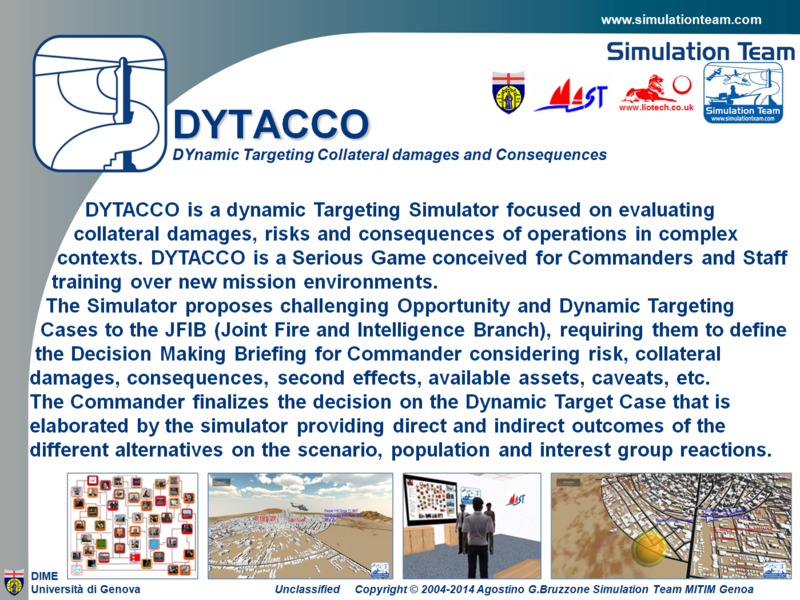 DYTACCO is a dynamic Targeting Simulator focused on evaluating collateral damages, risks and consequences of operations in complex contexts. DYTACCO is a Serious Game conceived for Commanders and Staff training over new mission environments. The Simulator proposes challenging Opportunity and Dynamic Targeting Cases to the JFIB (Joint Fire and Intelligence Branch), requiring them to define the Decision Making Briefing for Commander considering risk, collateral damages, consequences, second effects, available assets, caveats, etc. The Commander finalizes the decision on the Dynamic Target Case that is elaborated by the simulator providing direct and indirect outcomes of the different alternatives on the scenario, population and interest group reactions.